HONG KONG, HONG KONG / ACCESSWIRE / March 14, 2018 / FireLotto is happy to announce the ICO token sale that shall begin on March 15, 2018. During the token generation event, FireLotto will make available, 100 million tokens (FLOT) with 77% of these targeting backers. Some 20% of the tokens shall be reserved for the core development team while the bounty program participants will have their hands on the remaining 3%. 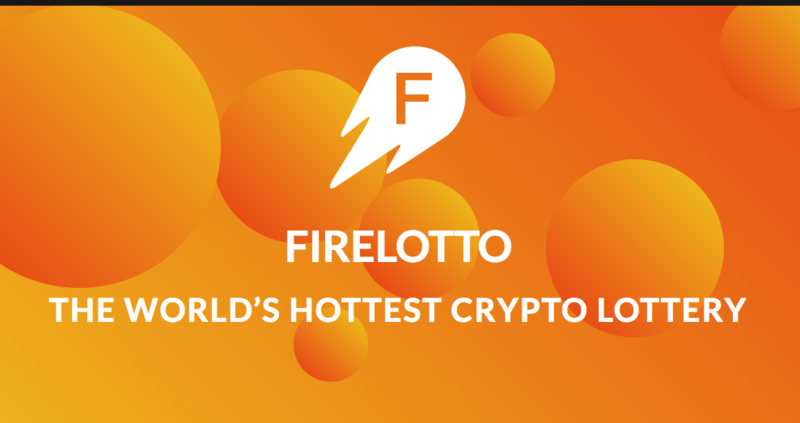 Upon launch, FireLotto shall be the first cryptocurrency lottery in the world. It is built on an innovatively crafted Fair Play principle that is hedged on the blockchain. FireLotto will revolutionize the gambling industry. As a token generation event, it is different from most ICOs because it has a product that has already been launched. Moreover, the lottery is built on the Ethereum blockchain and uses Bitcoin's decentralized protocol to ensure fair play. The lottery employs a secure Random Number Generator (RGN). FireLotto has an interface that is easy to use; its one-click buying mechanism makes it fast, reliable and convenient as well. At the same time, the FireLotto launched a SAFT agreement (Simple Agreement for Future Tokens), which will see the FireLotto's ICO documents being filed with the SEC, thus opening the door for US investors to participate in the pre-sale offering that will guarantee the 15% discount on day 1 of the ICO proper. So, for the first time in almost 15 years, American investors will be allowed the opportunity to be part of the online gaming industry by being investors in FireLotto and consequently, partakers of the prize pool of online lottery games. The FireLotto shall present four kinds of lotteries; the 4/20, 5/36, 6/45, and the Roger's Wheel. Collectively, these four make up the FireLotto, which shall use the Ethereum smart contracts to conduct the lottery, collect and distribute the funds, randomly draw the winning tickets and pay the token holders', the sales commission of the lottery ticket sales. As the name suggests, the 4/20 lottery distributes the prize pool to players that match up to 4 numbers. In this lottery, participants that manage to match between three and four lottery numbers get 66% (33% for each group) of the total prize pool while players that match two numbers get 34% of the pie. The 5/36 lottery pays out the prize pool in bits of 25% to the four classes of participants that match from 2 to 5 numbers while the 6/45 lottery pays participants that match from 2 to 6 numbers with each level getting 20% of the prize pool. The Roger's Wheel, on the other hand, is an instant lottery that combines the gameplay of a slot machine and a traditional wheel of fortune. Here, players shall place bets that range between $2 and $1,000 (Approx. 0.003 and 1 ETH). These wagers give players the opportunity to choose payout rates that vary from 2 to 20, which are the multipliers of the players' winnings. Next, players get to have a go on the Wheel of Fortune, which has 21 segments. If the stops on the player's chosen rate, then he or she wins instantly with the prize multiplied by the player's chosen rate. The tokens shall be remitted to the investor's wallets one week after the ICO closes. For more information about the ICO, please visit the website. Interested persons can also read the whitepaper here, or pose whatever other questions they have to the FireLotto community managers on the Telegram channel.